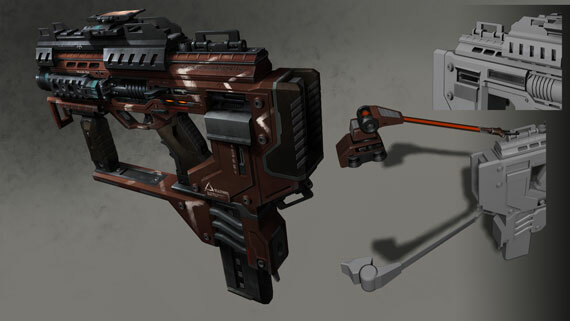 Favoring function over form, the SMG is a lightweight, semi-automatic weapon designed for close-quarters combat. What it lacks in stopping power and accuracy it grossly overcompensates for with quantity. Designed to injure and impede, the hailstorm of bullets the SMG produces is most effective in tight spaces against multiple targets. This original design is a paradigm of Minmatar construction. An inelegant, but reliable weapon solution that is simple to produce, easily repaired using almost any available materials, and provides comparable pound-for-pound performance with similar sub-automatic weapons. Although an unabashedly low-tech weapon, it excels at what it was designed for: killing anything right in front of you.